NOVA: Richard, you've had this dream of flying around the world for some time, and have even been involved in another global attempt. Do you think this project is truly the one that will make it? Get RealAudio software BRANSON: Well, the odds must be against anybody being able to fly around the world in a balloon on the first attempt. All of us who are attempting to go around the world in balloons are effectively flying in experimental craft because these craft cannot be tested. The balloons only have one life and the only way of finding out whether they work is to attempt to fly around the world. So, obviously we hope that we'll be successful this December or this January, but the odds have to be, I suppose, against success. But we're going to give it a very good try. 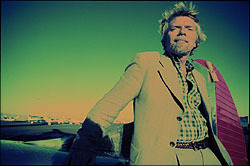 BRANSON: Basically, if you take the trans-Pacific as an example, we basically shared the flying. And if you take a trans-global trip, we may be up there for maybe fifteen to thirty days. It's going to be very important that each of us get into a fairly routine day so maybe eight hours of flying, eight hours sleeping, eight hours resting. So I think that's the best way it's going to work. NOVA: Our main focus is the science and technology behind this kind of ballooning: the meteorology, the atmospheric layers—what do you think students can learn by following your adventure? BRANSON: Well, I think there's a lot that could come out of this. And obviously, from our own personal point of view, the principal challenge is a personal challenge. But quite often from personal challenges, science is pushed forward—for instance, the ozone layer, which is being damaged by all the pollution that's being pumped into it. It's very difficult to know just how badly damaged it is and in what particular place in the world it's the most damaged. If we're successful in flying around the world in a manned balloon, and if we craft the technology for other manned ballooned attempts to take place in the future, then the ozone—testing equipment that we're taking on in this trip could become commonplace in other manned balloons in future years. And by really carefully monitoring how badly the ozone is being damaged, that can alert countries and governments to act much quicker than they, perhaps, have acted up to now. I think that could be one of the most important things that comes from this trip as far as future science is concerned. As far as the present is concerned, obviously it is interesting for people to realize which direction the wind goes and the fact that if you put up a balloon in Morocco, you will go in an easterly direction to go around the world and that ultimately, a balloon should—all going well—go the whole way around the world, just blown by the wind. It is difficult to steer a balloon. Sometimes, though, we do find that winds at lower altitudes go in a slightly different direction from winds at a higher altitude. So we do on occasion have a little bit of an opportunity to steer it but not a great deal. But basically, we are at the mercy of the winds and, interestingly, when you take a trans-Pacific flight as an example—we headed off from the south of Japan, we were heading for Los Angeles, and we actually missed Los Angeles by 2.5 thousand miles. So it's not a very predictable science. NOVA: It seems that you have a personal interest, obviously, because your personal safety sort of relies on the meteorology. You certainly will have to rely on cutting-edge forecasting. What have you learned from your past record-breaking flights in terms of the science and meteorology? 14.4 | 28.8 | ISDN BRANSON: Well, I think the first thing that we learned before we did our Atlantic crossing—everybody said it would be impossible for a balloon to fly in the jet stream—that these enormous winds, these winds that go up to about 300 miles an hour that travel in the jet stream, that they would tear a balloon apart. Now first of all, the jet stream is created by the very cold air from the Arctic coming down and meeting the air from the equator, and that air has to go somewhere, and it heads off around the world and, in particular, in the cold winter months, that is when it's most consistent and so we're actually having to fly at a time when, in a sense, the seas are the most ferocious and the most inhospitable. But it is the only time that one can actually find consistent jet streams around the world which can maybe propel us the whole way there. The jet stream is a very strong force and pushing a balloon into it is like pushing up against a brick wall, but once we got into it, we found that, remarkably, the balloon went whatever speed the wind went. And actually, I think our average speed across the Pacific was about 175 miles an hour, which is quite phenomenal. NOVA: I'm sure a million people have asked you this question, but assuming you launch successfully, what will be your biggest worry once you are aloft? BRANSON: Well, obviously, there are a lot of concerns. The one advantage of going in December/January is that the very high thunderstorms and lightening storms that you get in the summer months, we don't get as many of those and so—being sucked into a thunderstorm is something which worries us—if the balloon was to come across a thunderstorm and we were in the lower half of that thunderstorm, we could easily get sucked in. And if you're sucked into the middle of a thunderstorm, the balloon could get torn to pieces. If we hit a thunderstorm above the middle of the thunderstorm, we believe that we should be bounced around the thunderstorm and we don't believe that we will get sucked in. So the thunderstorms are something which we would rather avoid. Lightning is something which, again, we would rather avoid. 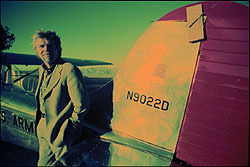 I think that, because we're flying in an experimental craft, things can go wrong, which can happen quite unexpectedly. Across the Pacific, we lost fifty percent of our fuel tanks when some of the wiring went wrong. We had a fire on board and the only way we could actually put that fire out was by climbing very quickly to where the air is incredibly thin, at about 43,000 feet, and, as the air is very thin it's very difficult for a fire to burn. We got blown off course and we ended up going into a ferocious snowstorm up over the Rockies. The storm was so bad that planes had to be diverted and helicopters couldn't get to us. But it was very beautiful; it was very unpleasant in one sense but when you see the burners burning and the snow twinkling, it had a beauty about it as well. Ending up in the sea is something which we have to hope that we can avoid. The capsule should be able to float. I think we're one of the only voyages to have taken off where we've had to pack clothes for a sea landing, clothes for a desert landing, clothes for an Arctic landing, and clothes for a jungle landing. And so before we take off, we have no idea where we're going to land. NOVA: How do you have enough room to fit all of you and your gear? 14.4 | 28.8 | ISDN BRANSON: Well, as the years go by, we're all putting on a little bit more weight than we should so we're going to have to get off to be successful soon in order to fit all of the equipment in, but initially, we will hardly be able to move. The capsule will be jam packed with everything from parachutes to rescue equipment, to food, to an enormous amount of water that we'll all consume in anything up to a thirty-day trip. And literally, we'll have to eat and drink our way through this in order to create more space. But on take-off, we will hardly be able to move. And also, the aircraft seat that we've got on board—we've got a British Airways seat because it's very important that that person stays awake, and so we went for the most uncomfortable seat we could find in the world. (laughter). NOVA: (laughter) And you don't mind us putting that on the 'net? BRANSON: (laughter) And I don't mind you putting that on at all. NOVA: Do you believe that you are flying in the best system, now that you know that there are a few other systems out there? 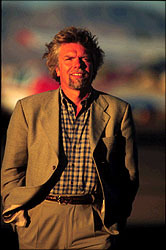 BRANSON: Well, what's the name of the guy in America? BRANSON: Steve Fossett is trying a very different approach to the approach that Per and myself and Rory are taking. He is flying in an unpressurized capsule, which means that he won't be able to fly much higher than thirteen or fourteen thousand feet. Maybe on occasion, once he gets used to the high altitude, he'll be able to go a little higher and would maybe be able to put oxygen masks on to go even a little higher, but he won't be able to keep it up for very long. If you're flying between fifteen and twenty thousand feet, the weather down there is particularly bad, often. And personally, I would rather try to fly above the worst of the weather and try to fly in the strong winds which are the jet stream, but what he's doing—people say that we're foolhardy and some people say we're brave—what Steve is doing is either very foolhardy or very brave, I'm not quite sure which. There are other people attempting it. There's another team attempting to fly and they're planning to fly about 90,000 feet, which is almost like a space trip. And I think in some ways, that would have a good chance of succeeding if they could get the technology to get up to 90,000 feet. Then there's another team who are going to take off from Switzerland. Their equipment is very similar to ours and their balloon is quite similar to ours, and I think if anyone were going to beat us to it, because I think that they may even take off before us, that they would have the best shot. Still the odds must be against any of us really succeeding but we're all going to have fun trying. NOVA: Do you consider it a race then? BRANSON: Of course it's a race. People race to be the first to climb Everest; people, I'm afraid, lost their lives in attempting to be the first to climb Everest. People tried to be the first to get to the Antarctic and a distant relative of mine, Captain Scott actually lost his life attempting to be the first. So it would be nice to be the first, but equally wonderful just to be able to fly around the world in a balloon whether one is the first, second, third, fourth, but people like to try to be the first, if possible, I suppose. NOVA: A lot of people are writing in to our web site and saying that they wish they were going with you. Is there anything you'd like to say to those people who'd like to join in, either vicariously or physically? 14.4 | 28.8 | ISDN BRANSON: Well, I think the interesting thing is that people either think, "What crazy people. I would never dream of doing something like that," or people nod their head madly and say, "If only in my lifetime I could have a chance to do something like this." We're very fortunate, in our opinion, to be able to have a chance to do something like this and we would love people to be able to, in a sense, join us on the trip, through following it on their websites or through the television—we'll also be making a documentary about it afterwards, and we'll be communicating on a daily basis back to the website to try to keep people in touch and not everybody can experience something like this, but we'd love people to join us on the trip.